New Bouncer Bliss is a cozy place for your baby to play and rest while you get a chance to take a shower or prepare a meal. The baby bouncer rocks gently when babies kick their legs or wave their arms. No batteries needed – the baby bouncer runs on pure fun! Playing in the baby bouncer also helps your baby develop motor skills and balance. 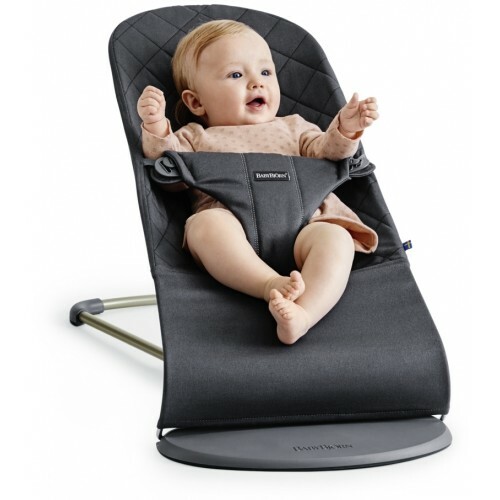 Bouncer Bliss can be used for newborns and up to the age of two. Award-winning baby bouncer in a new design - A gray base and frame give a soft look. The single-color mesh fabric creates a luxurious feeling and makes an attractive addition to your home. Folds flat and convenient to carry - The baby bouncer is easy to fold up and takes up very little space when folded. Three positions - Three different positions for play, rest and sleep. Natural rocking stimulates your child’s development - The baby bouncer is gently rocked by you or your baby’s movements. No batteries required. The rocking helps your baby train and develop balance and motor skills. Long period of use - The baby bouncer can be used for newborns (minimum weight 8 lbs/3.5 kg) and up to the age of two. When your child has learned to sit without help, you simply turn the fabric seat around and use the bouncer as a comfy children’s chair. 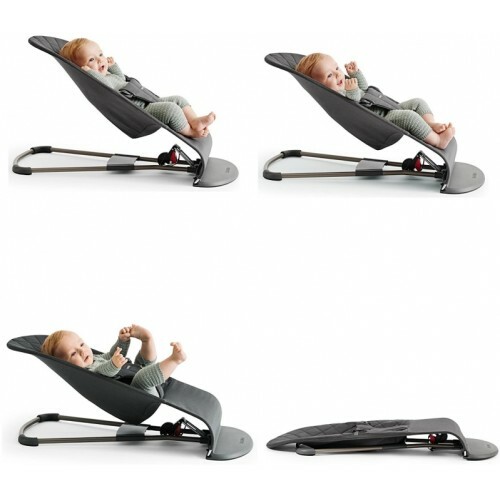 Ergonomic design - The baby bouncer gives good support to your baby’s back, neck and head. 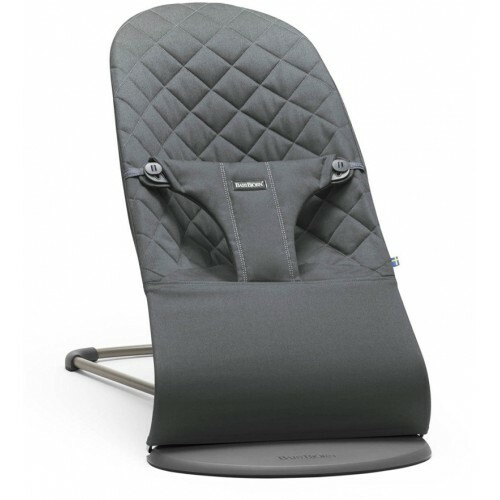 The fitted fabric seat distributes your baby’s weight evenly, which is particularly important for newborn babies. Happy baby, happy parents - Your baby can play and rest in the baby bouncer while you get a chance to take a shower or enjoy a cup of coffee. Child-friendly material - The baby bouncer is available in two soft materials: comfy, quilted cotton and airy, quick-drying mesh. It is free from harmful substances and approved according to Oeko-Tex Standard 100, Class 1 for baby products. Easy to clean - The fabric seat is easy to remove. Machine wash warm (40?C). Bouncer (max 20 lbs/9 kg) - Always use the restraint system. Make sure that both buttons are locked. You can adjust between two positions. Stop using the product as a bouncer once your child can sit up without help. Chair (max 29 lbs/13 kg) - Use as chair when your child can walk and sit on his or her own. In order to convert the product into a chair, all you have to do is turn the fabric around.